Two work parties took place in April and May. April 23rd was our Earth Day celebration. We’d planned on spreading mulch around the base of the trees, but for some reason, the mulch never showed up. However, that left a good amount of time for weeding around the trees. We finally got the mulch, and held another work party on May 21st. Armed with 6 yards of mulch, and NEW wheel barrows and pitchforks, we made (pretty) quick work of dispersing the mulch around the trees. Now we just need more mulch to get to the trees higher up in the orchard. 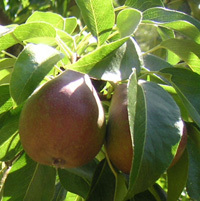 Join us June 4th for another work party to put foot socks on the developing apples and spread more mulch.